Seven monk artists from the Drepung Loseling Monastery in Atlanta will construct a sand mandala painting in the Oxford College Library this week. Their appearance is sponsored by Oxford’s Pierce Program in Religion and part of the Mystical Arts of Tibet tour to promote the monastery and the artistic activities of Tibet. The mandala's construction can be viewed in real time through a web camera link or by visiting the Oxford library. 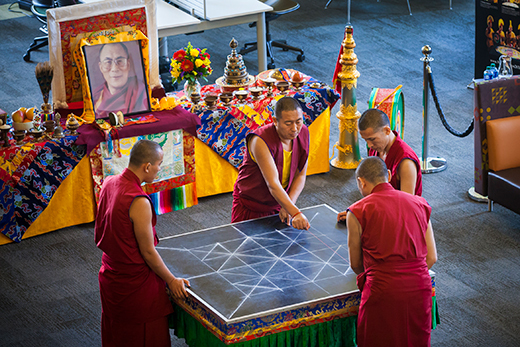 Events began with an opening ceremony Monday, Feb. 20, and the mandala construction will take place throughout the week on the library’s first floor. A lecture titled "Symbolism of the Sand Mandala in Buddhism" will be given on Thursday, Feb. 23, at 7:30 p.m. in Oxford’s Williams Hall. His Eminence Gonsa Rinpoche will speak to students at this event, with translation by Geshe Nyima Tsering. At age eight, Gonsa Rinpoche received his novice ordination from His Holiness the Dalai Lama. In the same year, he joined Drepung Loseling Monastery in South India for his monastic training. While pursuing his traditional monastic academic studies at the monastery, Gonsa Rinpoche also received numerous advanced Tantric Buddhist teachings, transmissions and empowerments from some of the greatest masters of Tibetan Buddhism. As an exceptionally gifted student, he completed his studies with the highest distinction, receiving his Geshe Lharampa degree (the highest academic recognition in Tibetan Buddhist tradition) in 2013. He then spent a year studying advanced Tantric philosophy and meditation at Gyumey Tantric Monastery, where he was awarded Ngagrampa degree. A closing ceremony and ritual destruction of the mandala is planned for Friday, Feb. 24, at noon in the library. All events are free and the public is invited to be present.